Finnlines has a fleet of Star class ferries each with space for 500 passengers, and nine classes of cabin to choose from, all of which have a private bathroom, satellite TV and comfortable beds. On board you find facilities includng a self-service buffet restaurant serving excellent German and Finnish food. The Sailor's Shop selling cosmetics, jewellery, sweets, souvenirs, drinks, alcoholic beverages and snacks. You will also finda gym and a sauna section with a jacuzzi for both men and women. Eckerö Line operates one of the largest ships on the Baltic Sea, the M/S Nordlandia. The ship can carry over 2,000 passengers and has various on board cuisine available on the famous deck 6. When on board any Tallink Silja ship you will find a wide range of on board facilities including restaurants, bars, disco, business lounges, wireless internet, TVs, shops and children's play areas. Whether you are on holiday or a business trip, Tallink offers a fantastic on board service. North, South and Western harbours in the Helsinki Ferry Port serve the passenger traffic passing through the ferry port. However, Helsinki port consists of many terminals depending on which company you use and also which route. As these terminals may change, we recommend that you arrive early at the port to find which terminal to use. We try to keep our addresses up to date but terminals do change frequently at this port. All the terminals are equipped with ATMs, luggage lockers, pleasant departure lounges, restaurants, kiosks, bureau de change and ferry check in points. Both short term and long term parking facilities are available with parking meters on location. 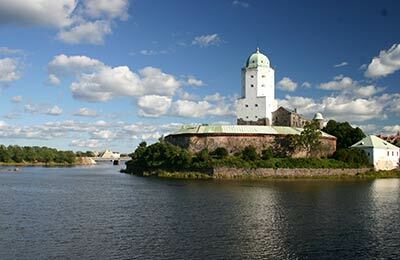 From Lahti/Porvoo: Take the motorway to Helsinki, then follow the signs leading to the centre for about 1.5 km. Turn right (Centre: Keskusta) and follow Varastokatu. After approximately 1.7 km you will reach Sörnäisten rantatie. Continue following the signs leading to the centre. 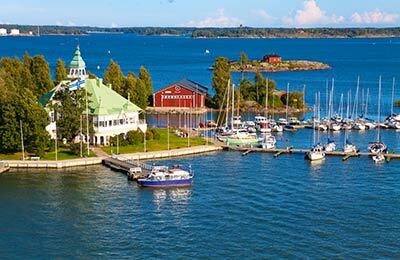 When you reach Pohjoislaituri , take the right lane and follow the signs leading to Katajanokka (ship symbol). From Tampere/Hämeenlinna: Take Hämeenlinnantie to Helsinki, follow the signs leading to the centre all the way to Mannerheimintie. After approximately 5 km you will see a white, round building (Svenska teatern) on your left side, turn left and follow Eteläesplanadi to the Market Square, then follow the signs leading to Katajanokka. From Pori: When you reach the roundabout in Pitäjänmäki, start following the signs to the centre. After approximately 1 km you will come to Mannerheimintie. From here follow the same instructions as above (from Tampere). From Turku: Take the motorway to Helsinki and then follow the signs leading to the centre (ship symbol). When you reach Mannerheimintie after about 2.5 km, follow the same instructions as above (from Tampere). From Hanko: Take the motorway to Helsinki and then follow the signs leading to the centre (ship symbol). Drive by the harbour and turn left into a tunnel on Uudenmaankatu. When you reach the end of Uudenmaankatu turn left and you will see a white, round building (Svenska teatern) in front of you. From here follow the same instructions as above (from Tampere). The main train station is located near the Rautatientori metro station and has domestic and international services. ExpressBus is a consortium of 30 express bus companies that offer frequent links by bus to the Helsinki ferry port. Buses to Helsinki ferry port depart from the bus station near Mannerheimintie.